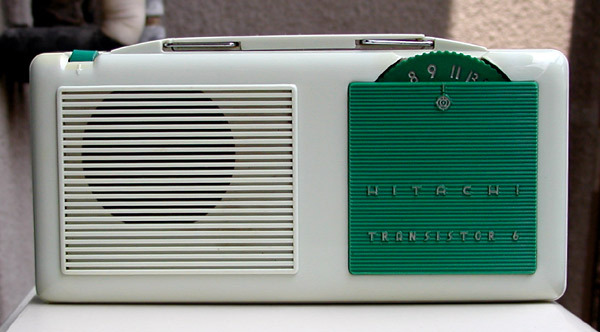 Thrill to the Beauty, the Power, the Performance of this mighty little portable radio, which uses six transistors and one germanium diode,  all manufactured by Hitachi, Ltd.
Production of the TH-668 began in the fall of 1957, and the sample shown on this page appears to have been built around January 1958. You are looking at the viridian color, but, according to the manual, there was also scarlet and blue-green. It's hard to tell from the photos, and isn't much easier in person, but there is a hint of green in the cabinet plastic. This color comes out best in a dimly lit room. Sadly, that is precisely the worst lighting conditions for capturing anything with a digital camera. And the cabinet tends to look grey in bright light.